Keeping chickens can be a dirty business, and chicks are especially dirty as they are clumsy and uncoordinated. A young chick may fall into its water dish and get bedding stuck to its feathers, it will be a messy eater and have food stuck to its bill and face, not to mention molting feathers and feces everywhere. So how can you clean your chicks? Why Chicks Need to Be Cleaned – Or Do They? Chickens are not pets, and it may seem silly to bathe a chick. In fact, many chicks will never need to be bathed, and as they grow, they will naturally shed dirty feathers through their seasonal molts. Chickens will also instinctively dust bathe and preen daily, working to keep their feathers in top condition. 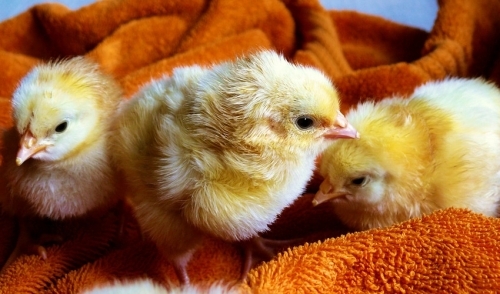 There are occasions when a chick will need cleaning, however, such as if the chick gets pooped on by another chicken or is particularly clumsy and gets extra dirty. Cleaning chicks as needed is part of proper chicken care, and will help minimize bacteria and insect infestations that can lead to illnesses. A clean chick will also make a better impression if it is to be shown or sold. Only bathe the chick on warm, sunny days with a light breeze so the bird will dry more quickly. A wet chick is quickly chilled and vulnerable to illness. Only bathe the part of a chick that is dirty. Minimal bathing will also minimize stress and preserve the bird's natural body oils that keep its feathers in top condition. Use lukewarm water to bathe a chick, ensuring the water is neither too hot nor too cold. Extreme temperatures will stress the bird and could cause injuries to delicate skin. Hold the bird gently but securely when first wetting the area to be cleaned. This is when the chick will flap and struggle and injuries are most likely. Soak the dirty area thoroughly to loosen dried, stuck-on dirt, feces and other muck. Using just water may be sufficient, but if needed, use a mild baby shampoo to clean the feathers. Use a well worn, soft bristle toothbrush to very gently rub feathers, legs and feet if necessary for cleaning, but take care not to break delicate feather shafts. Rinse the chick well with warm, clear water until all traces of soap are removed. Proper rinsing will also remove any remaining particles of dirt, sand or feces. Wrap the bird well in a soft towel or clean rag to absorb as much water as possible. Do not rub the feathers, however, which could lead to excessive breakage. Use a hair dryer on the lowest heat setting to finish drying the chick's plumage. Never use higher settings that can quickly overheat chicks and cause burns. After the bath is finished, sterilize all tools, basins and surfaces used, and wash your hands thoroughly with an antibacterial soap to avoid any contamination. It is not necessary to bathe chicks often, but when they do need cleaning, using the proper technique can minimize stress and keep chicks healthy, happy and looking their best.